The LAN9220 is a full-featured, single-chip 10/100 Ethernet controller designed for embedded applications where performance, flexibility, ease of integration and system cost control are required. The LAN9220 is fully IEEE 802.3 10BASE-T and 802.3u 100BASE-TX compliant, and supports HP Auto-MDIX. The variable voltage I/O signals of the LAN9220 accommodate lower voltage I/O signalling without the need for voltage level shifters. 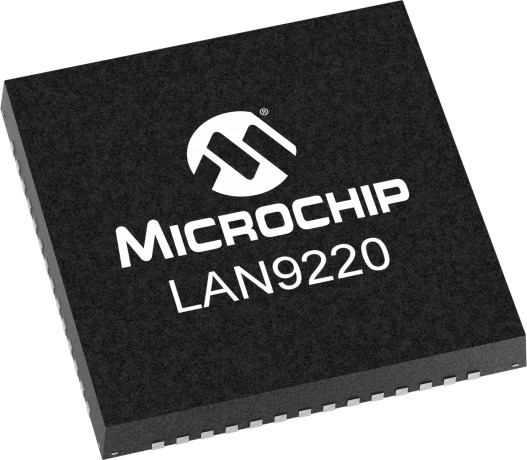 The LAN9220 includes an integrated Ethernet MAC and PHY with a high-performance SRAM-like slave interface. The simple, yet highly functional host bus interface provides a glue-less connection to most common 16-bit microprocessors and microcontrollers as well as 32-bit microprocessors with a 16-bit external bus. The integrated checksum offload engines enable the automatic generation of the 16-bit checksum for received and transmitted Ethernet frames, offloading the task from the CPU. The LAN9220 also includes large transmit and receive data FIFOs to accommodate high latency applications. In addition, the LAN9220 memory buffer architecture allows highly efficient use of memory resources by optimizing packet granularity.